the italiagal: Style Sunday: Shopping Spree! Maryland's Tax-Free Shopping Week starts today. One is not charged the 6% sales tax on clothing and footwear priced under $100. For this event, I budgeted funds for some much-needed clothing and accessories, more than half these items were basics. Not used to spending money on these things anymore, I was excited to indulge in a shopping spree. 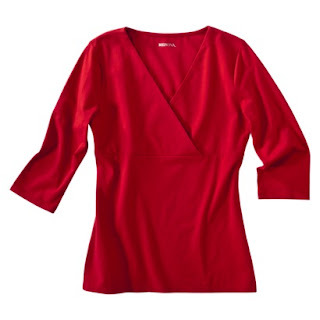 On Friday night, I bought a couple of online exclusives, including a three-quarters sleeve top in my favorite color, a deep pink, from Target. I think I blogged about this item so long ago! I hope it fits! 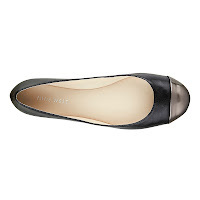 After that, I ordered a pair of ballet flats from Nine West. 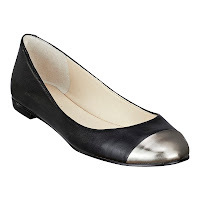 I love a cap toe, very Coco Chanel. I hope that they're cute in person! Again, I've been wanting them for such a long while! I continued my shopping in stores on Sunday. First, I picked up the classic white shirt from New York & Company that I posted about before. Finally trying it on, I liked the fit. I will get a lot of use out of this. 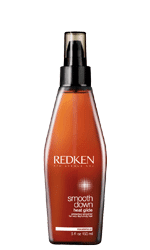 Next, I bought a bottle of Redken Smooth Down Heat Glide. This product helps to protect my hair from heat styling and to tame frizz. I've been buying this for years. At Victoria's Secret, I bought another basic. Then, it was a plain white camisole from the Ann Taylor Loft Outlet. This new one replaces two dingy ones. As a layering piece, I wear it under a shirt or a thin tee. After that, I purchased a 2-pack of scoopneck t-shirts under the L.O.G.G. brand at H&M. One is white because I love a plain white tee and it replaces my very worn one. I try my best not to wear anything past its prime. The other is navy, inspired by my style icon Catherine, the Duchess of Cambridge, who seems to sport this particular shade of blue often. I usually do not wear navy, but will give it a try. It looked nice in the fitting room. Good job with these picks! I love simple clothing with some nice accessories.